Inflatable paint booth for car is an ultramodern, stylish and attractive booth that is made with high quality expandable material. It comes in form of a portable bag that can be transformed into a large, tightly constructed booth in just a few minutes. You can find them in different sizes and enthralling colors to choose from. Using inflatable paint booth is now the most trendsetting way nowadays to manage limited space that is rarely available. You can temporarily use the available space and once you are done you can deflate it thus making it flexible in selecting the location where you want to work using this booth. This luxurious booth is expertly made to endure all kinds of weather without getting damaged by intense sunlight or blown away by wind. With its nature, amazing adjustable options, this inflatable paint booth can be used by endless varieties of tasks from car painting to selling, advertisement and promotions. The main significant purpose is to allow paint technicians to paint the car in the booth. Since it provides a shed for the painted car, it is ideal compared to painting the car in open air. With clean filters inflatable paint booth is 98% efficient as far as EPA 6H rule is concerned. 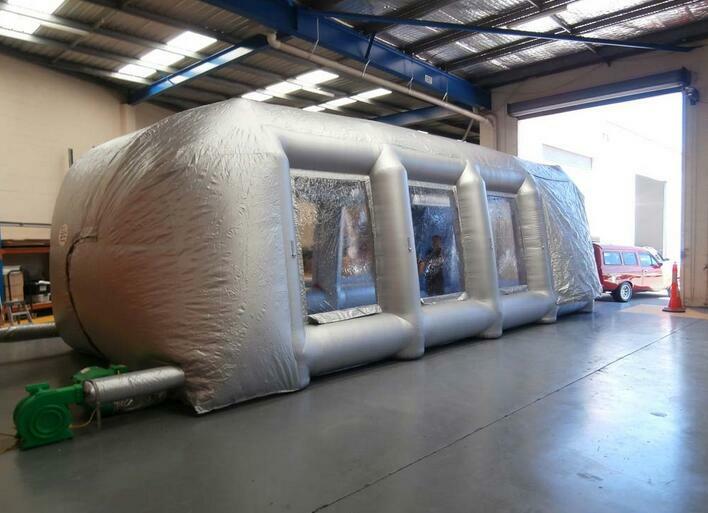 All the materials used in making inflatable paint booth align with the NFPA 701 test which is the standard methods for fire tests. It is therefore Eco-friendly and meets the health and safety requirement standard. It is widely–known and highly demanded because of its tremendous importance globally.